In the new book there is chapter about dogs talking. It was too late to add to the book but I would like to report four Jack Russells who live on a boat in Key West who have said, Let’s go! and Where were you? If anyone has more reports I would be very grateful. 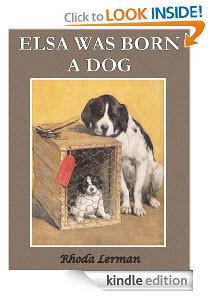 Elsa was born a dog. I was born a human. Things have changed. 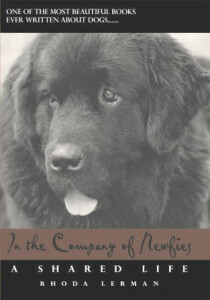 author of In the Company of Newfies. In Rhoda Lerman’s newest book about her dogs, we get to know Elsa, a very large, black and white Newfoundland, as she struggles to be human, to speak, to act, and to think as we do. Because of her profound and intense relationship with her humans, Elsa has become a person-dog, happily living her life on the interface between human and dog. Lerman, who is always trying to understand her dogs and join their universe, has struggled to become a dog-person. Elsa and Lerman understand each other. When Elsa has puppies, seventeen of them all at once, it is important that the 150 pound Newfoundland is able to remember her dog instincts. But Elsa is a reluctant mom, overwhelmed and terrified, and she needs Lerman to take over the task of caring for her enormous litter. As Elsa (person-dog) and Lerman (dog-person) live through the fragile, joyful, terror-filled days of birth and growth, we watch as the two of them discover more of what they need to know about each other and ultimately about the universe. Much praised fiction writer and playwright, Lerman’s first book about dogs, IN THE COMPANY OF NEWFIES, now a classic, has become a bible for dog owners for its depth of understanding and vision. This book takes the reader to new and visionary levels about the relationship between dogs and people and what is possible.